Mark your calendars now for our annual Family Concert & Instrument Petting Zoo! Featuring an Instrument Petting Zoo immediately after the concert. Thank you to Keeney Brothers Music for sponsoring the “Zoo”. 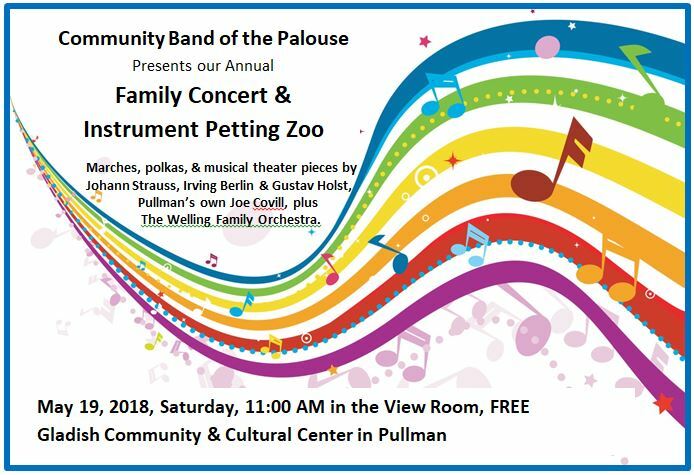 Please join the Community Band of the Palouse at our annual Family Concert on Saturday May 19 at 11AM in the View Room at Gladish Community Center in Pullman. The free concert features classic marches, polkas, and musical theater pieces by composers such as Johann Strauss, Irving Berlin and Gustav Holst as well as Pullman’s own Joe Covill, and special guest performers, The Welling Family Orchestra. The concert will be followed by our popular “musical instrument petting zoo,” hosted by Keeney Brothers Music, that allows children to see, hear, and play band instruments. Students entering 6th grade band at LMS especially benefit from this experience. Questions? Contact us at palouseband@gmail.com.